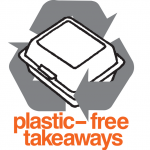 Recognising the problems of littering and ocean plastic pollution are urgent problems, our campaign Plastic-Free Takeaways was asking take-away businesses in Levenshulme to stop using plastic food and drinks containers and cutlery, and instead offer compostable eco-friendly alternatives. As a start, we created a leaflet and spent time at Levenshulme market to raise awareness of plastic as a global and local problem. We gathered consumer support encouraging local takeaways to switch to more eco-friendly packaging. Despite the overall high number of signatures, we had only a few of them for each takeaway and encouraging change was difficult. We took time to decide on a more feasible and realistic plan of action for reducing plastic in Manchester and teamed up with several interested individuals and groups to work with councils on their Plastic Free Greater Manchester campaign.